Some design make through easy way but some are tough. This tutorial will make with the using of adobe illustrator. Now type out some word as your choice in where I choose “LOOM”. I used the font as ITC Franklin Gothic Heavy also should have to make sure that each letter into a different box. Then go to effect -> 3D -> extrude and bevel and set the letter as you want.Now I will work with adobe Photoshop. Create new document, and then fill with the black of its background. Put text created into illustrator. Make sure each word is into different layer. Resize all of the word of text, adjust its angle and set it with your own choice. Now we are going to make its background. Now grab ground texture which we download before then decrease its size. It’s the time to start adding fire. Fire we can make with fire with using lasso tool and cut out the parts of fire. Cutting fire pieces take into on text and place as looking real around of the text. Change the blend mode into lighten and make its some places black so that it get the realistic looking. 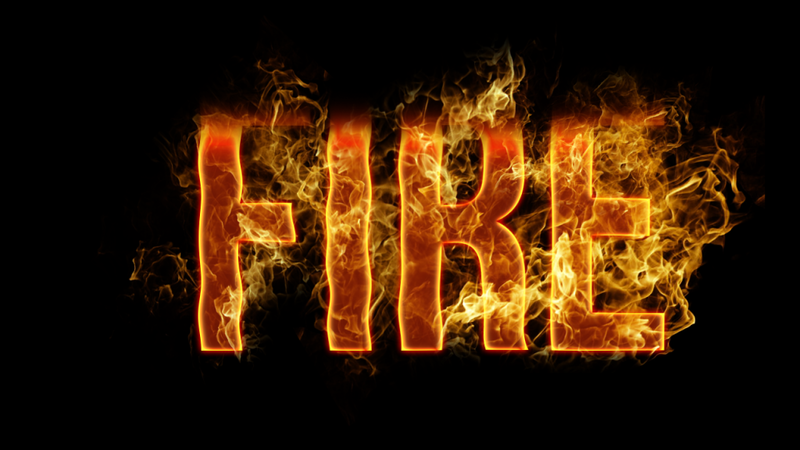 And play around the flame until get the expected color and design of your text. Apply layer mask on each test layer and use a soft black brush with the soft edges and paint out of around the text fire. Now add a shadow so that it makes it high contrast. Now go to into filter -> blur -> radial blur. Put amount of 100 and set blur method as zoom. Here we got our fire as we want. Here each letter keeps into new folder and add shadow usually for the high contrast and highlight the text. Add opacity 20% and make under the text dark. The fire text is ready.